Columbia Institute, LOCO BC, and ISIS Research Centre at the Sauder School of Business. The Power of Purchasing, completed in cooperation with the Columbia Institute and ISIS at the Sauder School of Business, shows that sourcing from local suppliers has a big economic impact. The study is the first of its kind in Canada. 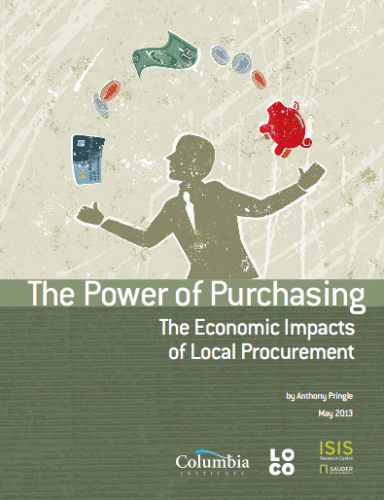 It found that purchasing goods from locally-based suppliers creates nearly twice as much benefit to the local economy as buying from multinational chains. In British Columbia, local governments and school districts alone spend more than $6.7 billion annually on goods and services. This purchasing can be used to reinforce economic development and support strong communities when some of that money is spent with local suppliers. Using office supplies as an example, the study found that Mills Basics, a locally owned B.C. office supply company, re-circulates 33% of their revenue directly to residents and businesses in B.C., compared to 17% and 19% for their multinational counterparts. This presents a 77%-100% economic advantage for B.C. from buying local, and an 80%-100% increase in jobs per million dollars spent. The increase in recirculation is attributed to greater employment on the part of the local company compared to multinationals, as seen in these figures. While purchasing policies and practice have traditionally focused narrowly on price, organizations are increasingly incorporating ethical and sustainability considerations into purchasing decisions. Local companies form the backbone of our economy, and LOCO has been advocating that businesses, institutions and consumers spend with local businesses because they support local causes, create local jobs and help build strong communities. Now we have the hard figures to back up just how much further the money goes when buying from local suppliers. PART 1 INTRODUCTION: WHY LOCAL?